Movement is the new exercise. Exercise is pedaling nowhere watching the miles click by on a monitor. Movement is breathing the fresh air, nodding to your neighbors and feeling the sun on your face. Movement is dance. Or stretching the kinks away, or even mowing the lawn. Movement can even be lifting weights in a sweaty gym, but not for me. Movement is physical activity, no matter how small. Exercise is a type of physical activity, but implies counting reps or miles and following a program in the hope of achieving a level of fitness. I love the idea of movement. But lately, I’ve been trying to be a little more vigorous about my movement without slipping into exercise. I have some autumn goals I’m looking toward, and I want to be strong and capable when they get here. For me, it’s a slippery slope to exercise. And I hate exercise. If it becomes exercise, (pardon my French, NIKE) I’ll just never do it. Last weekend was hot and humid. It was my least favorite weather. And for a Minnesotan to say it was the worst weather of all, is saying something. I strapped a water bottle to my bike with the intention of cycling just a little bit farther than I had the time before. And I did. Until, on the way back, I ran out of gas, so to speak. My water was warm. It was hot in the shade. Even after resting, I had trouble swinging my leg over the crossbar without losing my balance. To make a long story short, I eventually made it home safely and was fine after resting in the back yard. Since then, I’ve had every excuse in the book why I can’t hop on my bicycle for even a few blocks. I’d ruined it for myself. The days of rest gave me some space to assess the situation. I hadn’t practiced mindful movement. I’d made the mileage the goal. I’d turned it into exercise, which I personally equate to mental, physical and emotional torture. So I pictured a meter. At zero is rest. At the far right is death. In between, the needle moves from leisure to torture. 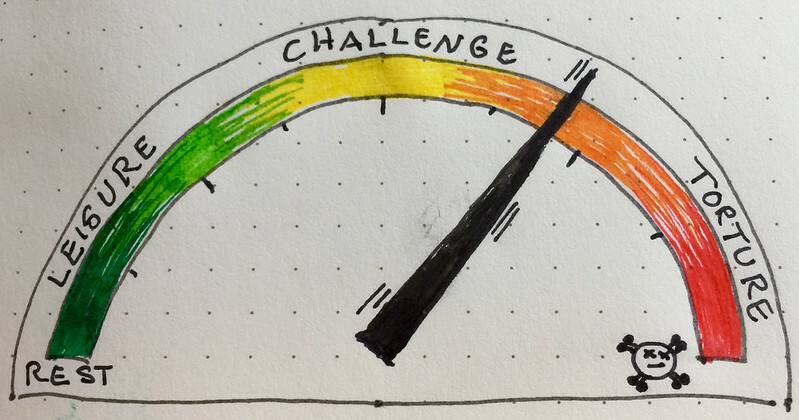 The sweet spot on the meter is where I find challenge. If I want to continue getting stronger, I need to push past leisurely movement and try not to venture into torture. The minute I hit torture, I’m going to shut down — physically, emotionally and psychologically — I’d literally rather sit on the couch feeling horrible about myself. For me, running a marathon or training for the Olympics sounds like self torture. I simply want to walk a 5k without limping across the finish line. This is the movement movement. It’s personal, it’s mindful and it feeds the body, mind and soul. Your title says it all Jean!! Loved this and so agree.